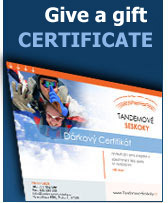 The internet presentation www.tandem-jumps.cz is created with an effort to reach the maximum accessibility of its content. It fulfils all important fundamentals of accessibility according to methodics Blind Friendly Web (project of United Organization of Weak-eyed and Blind), amendment of Act No. 365/2000 and WCAG 1.0. All the texts are defined in relative units and they can be very simply enlarged and shrinked through the standard tools of internet browsers. HTML documents are made up with structural XHTML 1.0 Strict. The cascade styles (CSS) are used in the visual presentation then. It is possible to switch off the cascade styles by the means of bequest switch off CSS (they can be switched on again). This function requires allowed cookies in the browser. The whole presentation is based on massive publication system myEdition© with the use of module myBusiness© which is provided for you by Anawe (www.anawe.cz - Everything for Your presentation, not only, on internet). If you find anything on these pages that is not in line with the accessibility demands, inform us, please and we are going to implement measures to despatch these shortages.